The unfulfilled germ of Notch’s 0x10c might have promised to transpose the spirit of Minecraft to the vacuum, but Space Engineers is already doing an excellent job of that. In Survival mode, careful cosmonauts uncover and recover parts for the construction and maintenance of ships and stations. In Creative mode, players build monuments to their own imaginations. You can do either, or both, for free until 9pm GMT / 1pm PST this Sunday. Space Engineers might have a blocky aesthetic, but real science runs in its centrifuge. The key tenet of its design is “modern-day NASA technology extrapolated 60 years into the future”. Mass, inertia and velocity inform the movement of objects through its void. Of course, real physics makes for really good collisions – so there’s plenty of fun to be had smashing ships into stations, too. 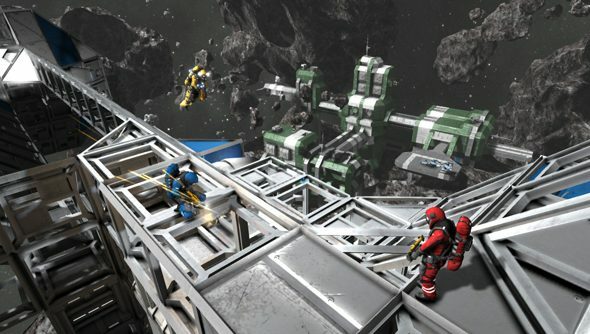 Space Engineers is still in early access but is, in its developers’ words, “very playable”. Multiplayer and Survival are two entire modes added since the game first landed on Steam, so you can expect a regular cadence of updates if you buy into the game at its current 40% discount. Do you think you might?